It was not all fun and games for the Yankees last night. Third baseman Chase Headley was not with the team today after getting hit in the jaw with a 96-mph fastball last night. Headley did not lose consciousness or any teeth after the incident. He went to see a neurologist this morning where doctors examined his chin. Last night Headley was able to walk off the field with minimal help. He is schedule to rejoin the team this weekend and will be monitored for concussion symptoms. Aside from Headley’s injury an amazing victory happened last night. 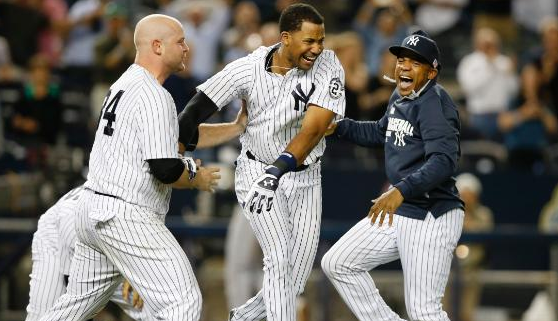 Chris Young doubled in the eighth inning for New York’s first hit and launched a three-run homer in the bottom of the ninth that paved the way for the Yankees to trail 5-4 over the Tampa Bay Rays. This ex-Met is definitely getting a lot of praise from fans around the world after winning the game.